Labor Day marks the unoffical end of summer. I'm sure many of you will be having one last cookout next weekend. 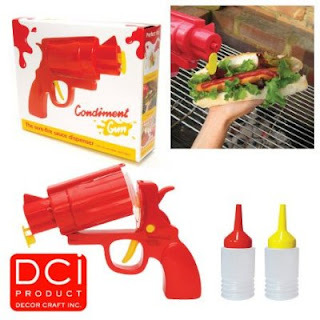 Wouldn't it be fun to dress your burgers and hot dogs with this hilarious little guy!? The Condiment Gun. (No, I'm not a fan of guns in general, hate them actually, but I make exception to ones that make a party more fun.) Wish I had one! Available here. Another thought... Kids would LOVE this! It might even get them to eat their veggies if they got to squirt some dressing on them. Since I showed you my youngest daughter's announcement yesterday, it's only fair (to both you and Ella) that I show you my older daughter's debut. We used "family trees" as a theme. On the cover we wrote "We've added a limb to our family tree". As you can see, we put an actual little limb on the top to really bring the point home. I am knee deep in party planning right now. I have a few events in the next couple of weeks, one of which is my daughter's second birthday party. In the midst of making table runners, favor boxes and decorations, I can't help but think about the day she was born. How can two years already be gone!? So while I continue on party projects, I thought you might like to see her birth announcement. On the front, I stamped baby footprints and added text that read "Our home has grown... by two feet". This "theme", if you will, fit our family perfect since my husband and I are both designers and constantly talking in "feet". And, yes she was a huge baby; no one needs to tell me that. I was the one carrying her, I remember. Both my girls were almost three weeks early and still weighed over nine pounds!!! I loved it - more baby to nibble on. A couple days ago, I showed you the cute pirate invitations my friend made for her son's birthday. Of course, one of the fun activities planned during the party is a treasure hunt with obstacles/activities. 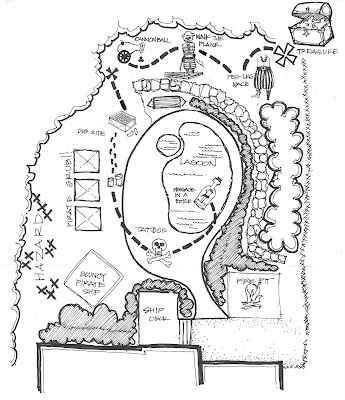 She asked me to draw the treasure map with all the obstacles throughout their backyard. So fun! Sara plans on tea staining the maps and coloring the treasure "X" red. Then they will all be rolled up and tied, put in a bottle, and floating in their pool. 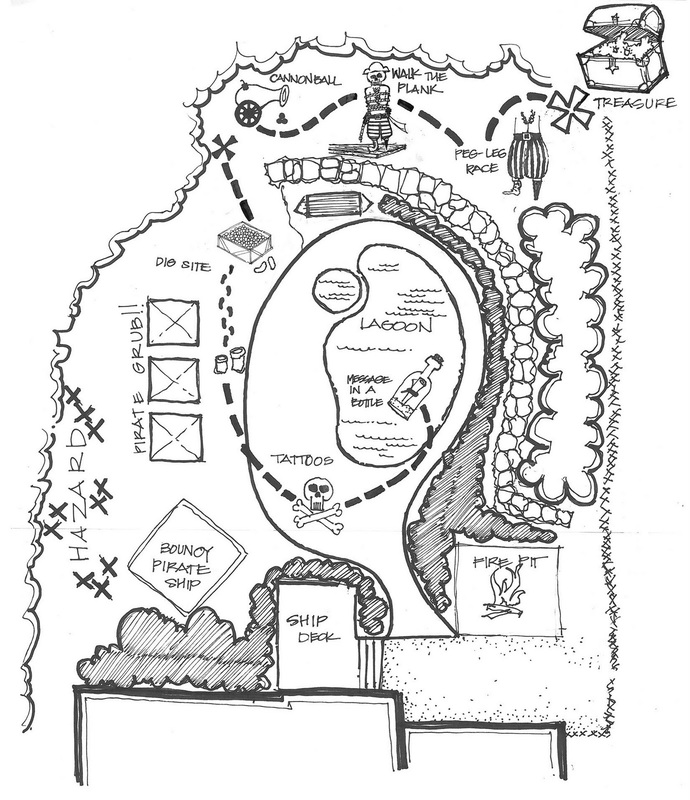 There will be a treasure map for each kid to retrieve. Don't you think the kids will love this!? Anyway, just thought I'd share in case anyone else has an upcoming pirate party. Boy, do I have a cute product for you guys!!! Look at these sweaters! 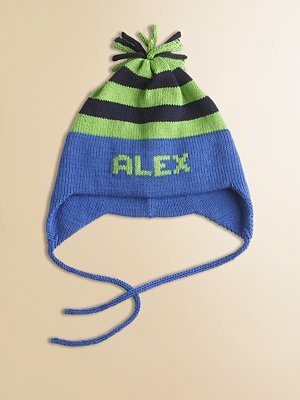 Look at these hats! 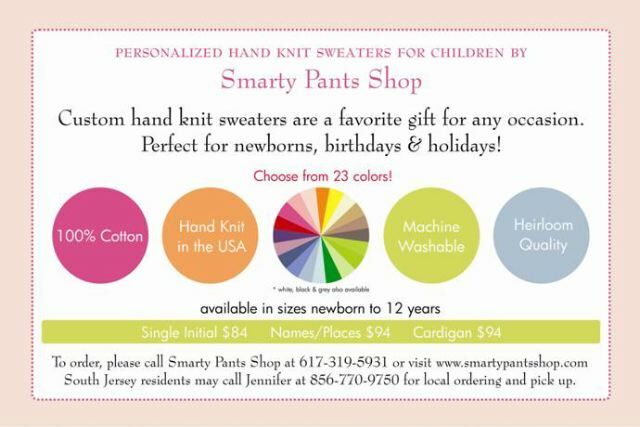 As everyone is headed back-to-school, Smarty Pants Shop has a great offer to make your kids look great. Order any custom knit sweater and get the second 1/2 off! Each sweater or hat is a hand knit, heirloom quality product that make wonderful, timeless gifts. 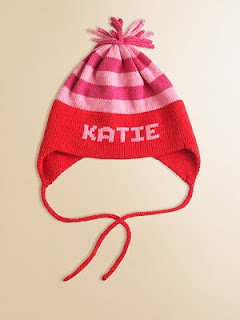 Each sweater and/or hat is totally customizable - initial vs. name, color of sweater, color of monogram, etc. Sizes range from newborn to 12 years allowing you to outfit all of your children. When ordering, use promo code APS Promo. Hurry! Offer ends Tuesday, September 7th, 2010. Now would you excuse me... I have to go order some for my kids! My youngest daughter's second birthday is fast approaching. I recently designed/created the invitations and put them in the mail. I am always trying to come up with a new and different theme for my kids' parties. Not that there is anything wrong with traditional themes (I use plenty myself on other events), but I just love the challenge. Clients aren't always up for something they have never seen before. I also make a point to choose gender neutral themes since we have as many boys as girls at both our girls' parties. Some past gender neutral themes I've done include golf, milk and cookies, around the world, and ice cream social to name a few. So anywhoo... I decided to go with a hand peace sign since it also is the way we communicate "two". So a sophisticated peace party if you will. Groovy huh!? Since her party will take place over Labor Day weekend, I decided to go with a red, white and blue color scheme. The invitations were a combination of computer printing and letterpress printing. I had custom plates made for the "two", used a ready-made plate for the sunburst behind, and then printed the actual party information from my computer. I raised the "two" logo up off the paper with scrapbook dots. Oh and look! Even the stamps fit in perfectly with the color scheme. Thanks US Postal Service! (About time you did something nice for me.) Love that they match! Obviously just a happy accident. We have some great friends who have a son named Jack. He will be celebrating his 4th birthday soon and I just had to share the initiations his mother made for his party. She, like me, loves a good piece of correspondence and this year's invite doesn't disappoint. She graciously let me show you guys her creation. Thanks, Sara! -I love how Sara jokes about any regrets will walk the plank - cute! Job well done, wouldn't you say!? I will be making Jack's cupcakes and, of course, will share the "treasures" (sorry, I couldn't help myself) with you after the party. Imagine my surprise when I was looking at the NY Times NY/Region section last week and saw one of my favorite clients! Sal Ferraro (left) and his brother, John, were photographed at the wonderful Leon's restaurant here in New Haven. The Ferraro family owns a famous market in New Haven and they have been involved with Leon's restaurant for years. Check out the article here. Last September, I helped plan one of Sal's events and Edward "Eddie" Varipapa, executive chef and owner of Leon's, was one of the chefs working the event. The food was fantastic! I recently had a cupcake order that I thought I'd share. 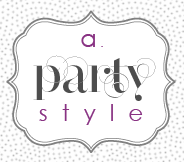 As the owner of her own business, my client wanted to celebrate her shop's first birthday. So she had a birthday party, of course! She owns Tantrum, a salon for children here in Hamden, CT. (Isn't that just the cutest name for a kids salon!?) It is such a cute place and she is always busy. The salon has a playhouse, a tv at each cutting station, and glitter and glamour party packages available. (You might remember, I made a cake for one of those parties.) This is just some of what makes Tantrum so special for the kiddos. So anyway, back to the cupcakes... She asked for the cupcakes to be "bright, cheery and colorful". I used the shop's logo for color inspiration. Jazzed them up with color coordinating sprinkles and made little birthday hats and "1's" for the toppers. Here are some pictures thoughout the process and the final display. That was so much fun!!! I learned a lot and met some wonderful people - such inspiring women! I've got to start saving my pennies now, so I can go again next year in San Diego. The highlight of my trip was meeting Kim from The TomKat Studio. I have been reading her blog since the beginning and I just love her. She is so sweet! I was so nervous to introduce myself to her, but she made me feel at ease quickly. And cute! Look how great she looks! As you can see, my make-up and hair had melted away by the end of the day. I couldn't pass up her offer of taking a photo together though. Thanks again, Kim! 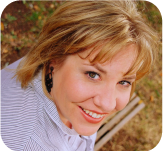 In the coming weeks, I plan on implementing things I learned while at BlogHer. So heads up for some changes. Hope you like them! Please (and I'm begging here) let me know what you think. We bloggers LOVE comments. As one of the panelists from a session I attended said "getting a comment is like getting a gold star". So true! Even if it's awful, we love to hear your feedback. We are doing this for you, our readers, afterall and we want to know if you like what you see. I'm getting geared up... This weekend I will be headed to the "Big Apple" for yet another conference - BlogHer '10. Being so close to NYC sure comes in handy sometimes. I am so excited - ready to learn a little, meet fellow bloggers (hoping to see some of my favorites!) and, of course, party and mingle a bit. I'll let you all know how it goes. Anyone else going? We went out to lunch with some friends this past weekend and got the cutest little presentation that I just had to share. Since we were only starting to eat at 1:45, we figured the kids would need a little something to tide them over so we ordered a basket of french fries. Look how they came out!!!! It's a little miniature fry basket. I know, right!? They are actual serving pieces so don't try to really fry anything in them. I found some online. Available here.